So this is actually quite simple, when using blogger. I think most blogging platforms have a similar functioning button as well, but i'm not 100% sure. 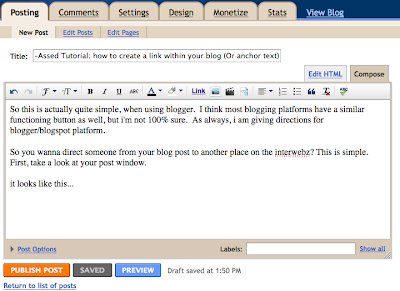 As always, i am giving directions for blogger/blogspot platform. 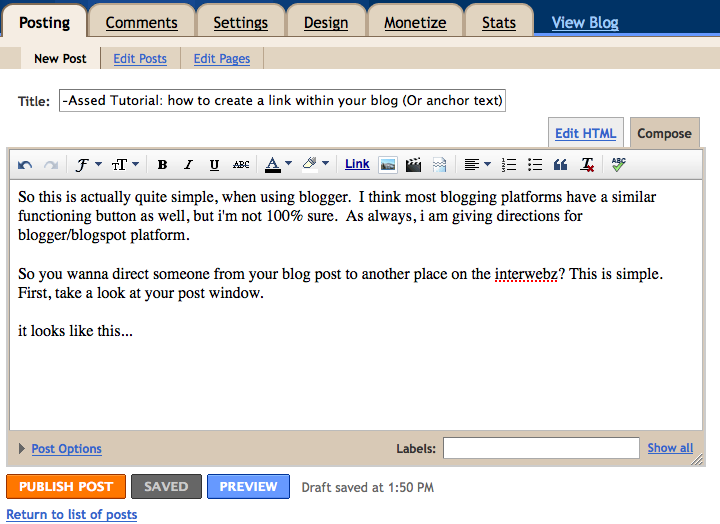 So you wanna direct someone from your blog post to another place on the interwebz? This is simple. First, take a look at your post window. Next, in your post window - type out the word that you want to use as your "Anchor Text" (these are the words that will become your link) and then highlight the text with your mouse. The text that you've highlighted will already appear in the first box. All you have to do is then enter in the URL to the place you want people to go when they click on the link. Et voila! 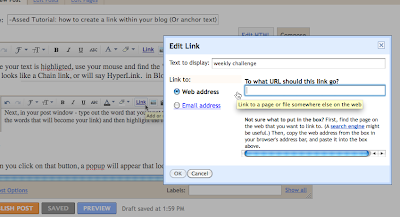 you've just created a link or anchor text within your blog post! Check out the Weekly Challenges!! You make it sound simple! Can this be true? I'll give it a go. Thanks Laura for your Tutorial. 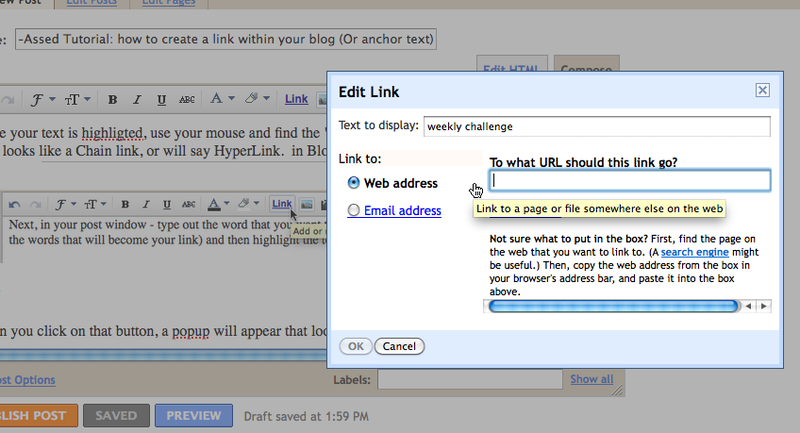 4) go back to my blog post window and paste the copied page address into the "To what URL should this link go?" slot. Sometimes I like to double check and I do the "check this link" thing. You are the master!!! Thanks so much...I was wondering how to get links and now I know!!!! Good Stuff - one of the very important basic things bloggers should know! 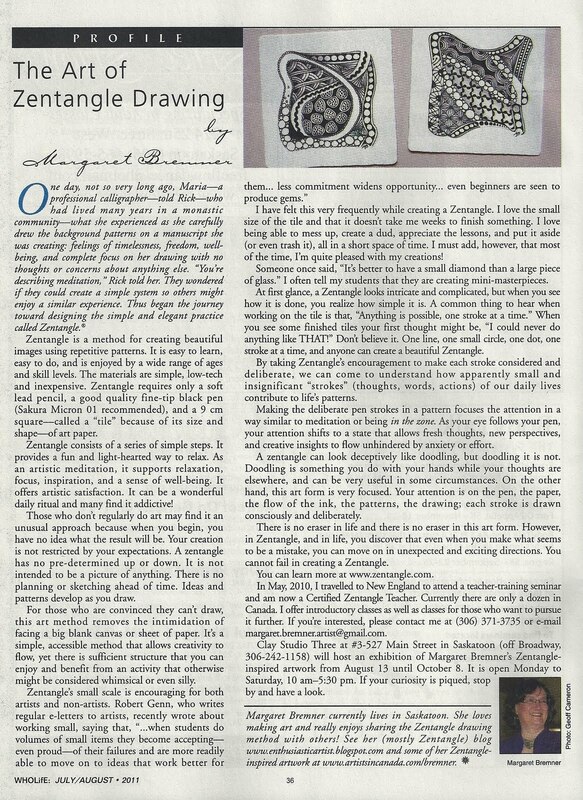 Makes you feel enlightened after creating your first link. Also, I often check the layout of my blog with the preview window. Make sure to test your links to make sure they work. If not, go back in and edit them (Copy and Paste are SO useful!). Wow! Thanks. You're a genius! !